According to Seattle Bride Magazine, The Golf Club at Newcastle has been designated the wedding venue that is the “Best Sunset Wedding Spot” in the Seattle area. I was there not too long ago for a wedding and had to made this shot to see what they were talking about. This was on one of those perfect Seattle summer days in the first week in July and as promised the sunset was indeed stunning. 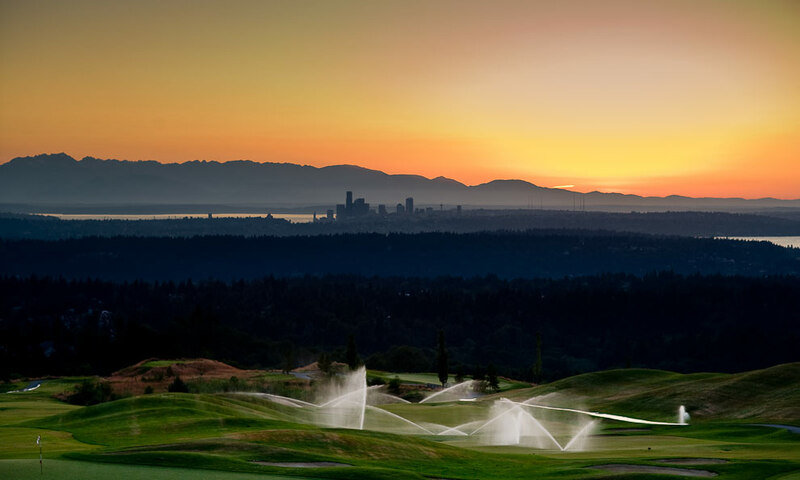 After the sun set into the Pacific Ocean behind the Olympic Mountains, there was still some twilight with which to see the sprinklers watering the greens catching highlights off the afterglow on the golf course. This entry was posted on Wednesday, April 7th, 2010 at 8:26 am	and is filed under PLACES and tagged with Landscape Photography, Seattle Wedding Photographer. You can follow any responses to this entry through the RSS 2.0 feed.